I recently joined OpenStreetMap to map an area in France I visit regularly (I live in Holland). The area in particular is Saint-Maurice-sur-Moselle. Many areas aren't mapped properly (roads and paths missing, etc) but something that strikes me is the lack of address nodes in the area. In the larger village of Le Thillot, I noticed that some addresses have been mapped. Many of them are however far away from the actual house; I suspect they indicate the location of the house's mailbox. I already started to move the tags from the loose nodes to the building ways (in JOSM, so I have not uploaded anything yet), but later I saw that there is no real consensus on how to map addresses. In inner Nancy (where every house is close together and close to the road), I noticed that every house has a node in the building way that indicates the house number and eventual amenity (this is an approach I can get behind). In Luxembourg (ville), addresses (and amenities) are tags on the building polygon. This is probably my favourite approach. 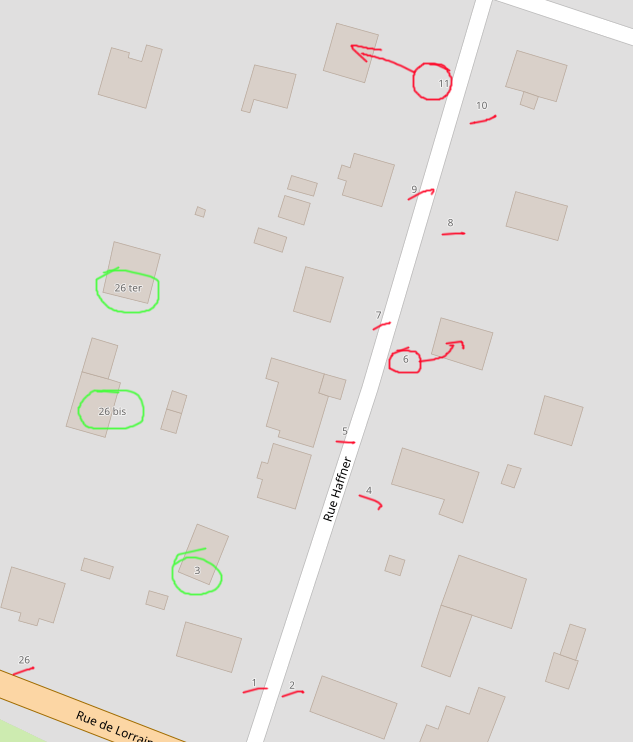 In my area in Holland, addresses are separate nodes that are not connected to, but inside the building way. This is an effect of a continuous importing project for both the addresses and the building shapes. I don't like it, but it's convenient for the import. How is it done in France, especially the rural areas? House numbers that float in the middle of nowhere make very little sense (see image) so in either case the nodes will have to be moved. But where should I place the tags? My practice is to consider an address as an individual object not necessarily associated to one building. It is possible to have one address associated to several buildings and also one building associated to several addresses. - at a point between private and public domains (this is what you show in your example). The numbers 3, 26bis and 26ter should be moved to respect this scheme.